The Pirates women’s team made the short journey to Livingston to start their 2018 Sapphire Series Division 1 North campaign. 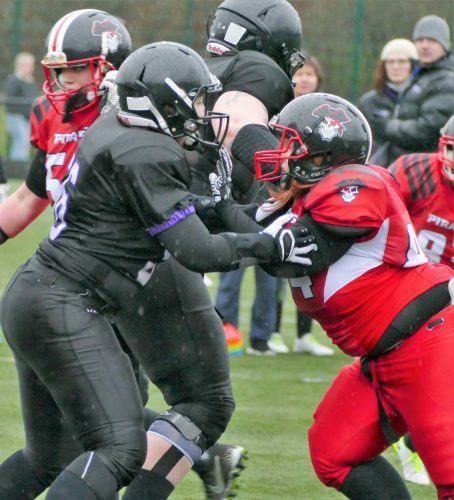 However, the draw meant that they would not face host club Edinburgh Wolves, but would instead take on the two other competing teams. Unfortunately, these were the two stronger teams, and a Pirates team heavy with rookie players faced a difficult afternoon. 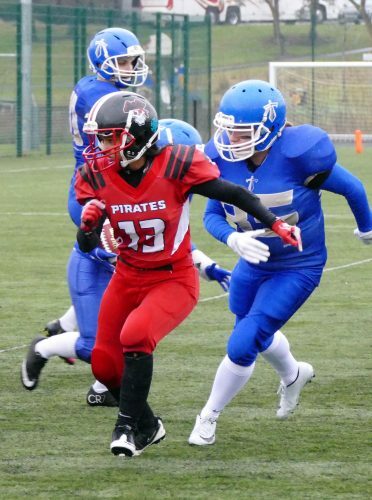 With their regular QB away on GB Flag duty, the Pirates started with Clare Cochrane under centre as they opposed Manchester Titans. After failing to achieve a First Down on their opening drive, EK turned the ball over to the Titans who immediately put their strong running game into place. A short drive was completed by a run from Sian Perry while Karis Smith added the PAT. 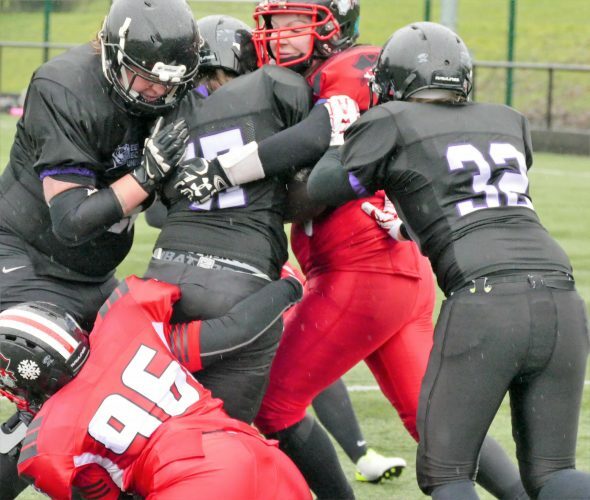 A second 4-and-out by the Pirates saw Manchester take possession again, but this time the Pirates defence held strong. This merely delayed the inevitable however, with Manchester’s three-pronged ground attack proving too strong for the Scots, Perry scoring her second converted TD of the game. A bad centre-QB exchange on the restart saw the loose ball recovered in the endzone by Ellie Partington, with Smith tagging on the extra point once more. The first half ended with EK’s offence giving up another score as a high snap was snaffled by Eloise Walsh in the endzone. Smith converted to give the Titans a 27-0 lead at the break. The second half followed a similar pattern. Keely Edmonds ran in an unconverted TD then Perry added her third score with Sian Kersse catching the 2PAT pass. A third Pirates fumble was recovered in the endzone, this time by Emma Jones with Smith converting once more. EK’s next drive again ended with the ball being coughed up and recovered by Titan Vicky Mills, the only consolation being that at least this time it wasn’t in the endzone. That relief was short-lived though as Manchester ran the ball home again on the very next play. Their final TD was on a long run by Kersse and Smith converted to leave the final score as 63-0 to the Titans. However, with 24 of those points coming from self-inflicted wounds, the margin of victory was slightly exaggerated. Next up was an even stronger Leeds Carnegie Chargers side who had already beaten the host Wolves side 46-7. Unfortunately this was to prove to be a total mismatch, with Leeds scoring at will on both sides of the ball. The second play of the game saw Courtney Harrison run the ball home and also add the PAT. EK’s response was short lived and QB Cochrane was tackled in the endzone for a safety. Harrison ran in another TD on the first play after the restart then Joanne Mann added a pick-6, converted by QB Lucy Peaty. Next on the scoresheet was Gaby Knops, and her TD was converted with a Peaty-Knops pass. Another safety was added to the score before the Chargers offence piled on more points with Peaty running the ball home and Knops converting. An interception by Marion Fernande gave Leeds a short field to work with and a repeat of the previous score saw Peaty carry home and Knops add the PAT. Leeds added one more TD on a Harrison run with Peaty converting before a third safety left the score at 54-0 going into half time. The second half stared as the first had ended, with the Pirates giving up a safety. Leeds now had Robyn Steward at QB and she quickly notched her first rushing TD, Knops again converting. Another safety was a brief interlude in the offensive onslaught. Steward passed to Peaty for the 9th TD and Harrison converted before another short Pirates’ drive ended in 2-points to the opposition. Steward ran in the next TD and then passed to Charlotte Conway for the PAT. Steward also scored on defence, picking off a pass and returning it to the house before passing to Knops to convert. Steward rounded the day off with back-to-back pick 6’s while Peaty ran in the 95th and final point of the game. So, a very hard day at the office for the Pirates women ended with two heavy defeats. However, they can be proud of their never say die attitude in the face of adversity. Having lost several players to injury across both games, they were offered the chance to end the Leeds game early during a lengthy injury stoppage, but chose to see the tie through to the end. The Pirates now have a few short days to lick their wounds before they head off to the second round of games in Leeds next Saturday, February 10th.